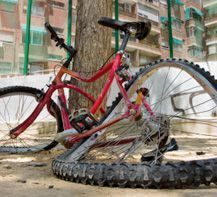 Who Can Be Held Liable For A Bicycle Accident? Seattle is one of the most bike-friendly cities in the country, which also makes it one of the most prone to bicycle accidents on any given day. Many commuters enjoy the health and economical benefits of biking to work every day, but the clash between cyclists and motorists is becoming more apparent every day. And since the number of riders continues to climb, the continuation of frustrating confrontations between drivers and bicyclists appears to be expected. But how do we determine who is at fault when a congested city environment leads to a bicycle accident? Despite the safe, healthy and eco-friendly connotations often associated with bicycling, it is actually a pretty dangerous activity to participate in every day. According to the National Highway Traffic Safety Administration (NHTSA), there were 630 deaths and 51,000 reported injuries from bicycle accidents in the United States in 2009. And because bicyclists lack the adequate protection to shield them from injury during an accident with a motor vehicle, it is all too common for the types of injuries sustained in a crash to be very severe. The NHTSA indicates that 60 percent of all bicycle-related fatalities stem from head injuries resulting a bicycle collision. But just because bicyclists are more prone to serious injury or death does not mean that motorists are automatically at-fault for these terrible bicycle accidents. So, the age-old question in the bicycle-motorist feud is; who is most likely to be responsible for causing a collision between a bicycle and a motor vehicle? We’ll get no direct help from the federal government on this question, as a spokeswoman for the Federal Highway Administration (FHA) recently said “fault is difficult to determine” in bicycle accidents with cars. What we do know is that there are a number of factors that can contribute to bicycle accidents. Perhaps the most obvious factor is size, and cars clearly take that category as they are much larger, heavier and can create blind spots for the drivers. And since 70 percent of all bicyclist fatalities take place in urban areas, it would be reasonable to believe that cars are more likely to be at-fault during bicycle accidents. However, an NPR article from last year cites an interview with Ed Beighe of the Azbikelaw blog about bicycle accidents and fatalities in Arizona. Beighe found in his state that 44% of fatalities in such accidents were caused by the cyclist while 56% were the fault of a driver. Minnesota published similar data, finding that cyclists were at fault in 49% of the state’s crashes in 2009 and drivers were at fault for 51%. In Arizona, the most common type of incident involved a cyclist being struck from behind by the driver. In Minnesota, the most common was a failure to yield to right of way. Even the Washington Post recently referenced data from studies suggesting that bicyclists were the most likely to be at-fault in a crash. Conversely, however, data from a study on Hawaii’s crash data indicated that motorists were at-fault in more than 83% of accidents. So what does all of this data tell us? First and foremost, it tells us that states across the U.S. vary in many ways regarding bicycle accidents with vehicles. Some are home to dense, urbanized cities while others are more open and rural. Some state legislators will have developed intricate bike-friendly transportation plans, while others may not be as advanced. All of these factors depend on the demand for bicycling in the given state. In Washington State, the number of riders has increased so greatly in recent years that it would be irresponsible for the state not to adopt efficient, bike-friendly options on the roads. In Montana, the demand is much lower and therefore bike transportation is not as high of a priority. Finally, this analysis shows us that both sides of the coin could stand to exercise a little more caution. Personally, I see a number bicyclists weaving in and out of lanes and running through red lights every day during my commute to and from work, almost as if the law does not apply to them. At the same time, I’ve also witnessed plenty of motorists blindly switching lanes and dangerously cutting in front of cyclists. The only way that we are going to see a decline in fatalities and injuries from bicycle accidents in Seattle is if we work together to make the roads safer for everyone.